All transactions are safe and secure with a reliable history in online purchasing behind each of our associates. 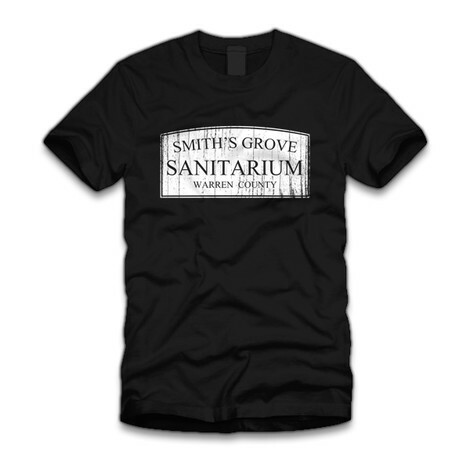 Buy the Smith's Grove Sanitarium Halloween t-shirt to own Halloween clothing and merchandise. The front of this bestselling Halloween t-shirt features the logo for the asylum that housed your favorite horror movie icon. Michael Myers broke out of Smith's Grove Sanitarium to look for his sister, Laurie Strode. Looking at the front of the tee, you can almost hear the ominous Halloween soundtrack theme luring him out of the confines of the sanitarium. This unique Halloween movie merchandise item is perfect for horror fans. In addition to the Smith's Grove Sanitarium Halloween tee above, browse the Halloween Clothing Gallery for more apparel like men's and women's clothes, kids shirts or hoodies.